STREAMS IN BURKINA FASO is a Spirit-led movement of more than 60 churches with a vision to see a vibrant body of Christ in every Dagara village transforming their community from darkness to light! STREAMS in Burkina Faso is GROWING! 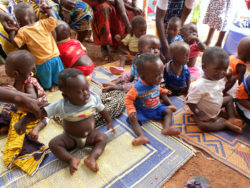 The Infants in Distress Program has reached over 400 children through our small office in town. Through the building of the new Infant Rescue Center (IRC) we will be better equipped to meet the needs of infants and their families furthering our ability to touch lives in the name of Christ. Please join us in prayer and/or giving a monetary gift. to the Infant Rescue Center. Infants in Distress: Marguerite & Registre from Daniel Gertson on Vimeo.